Beaches, they get all the attention. Everyone who comes to Bohol angles to stay as close as possible to Alona and White Beach. 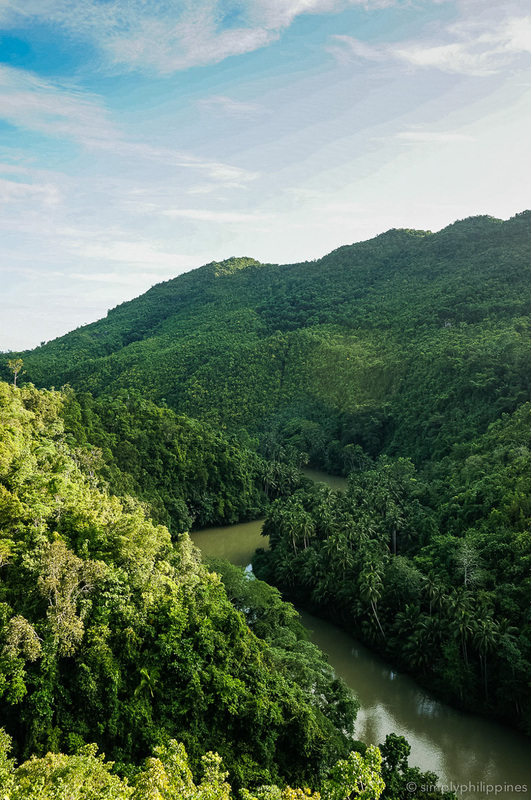 But along the Loboc River, in the island’s lush interior, you’ll find a different world: green, glimmering, soothing, and strange all at the same time. I always recommend that friends coming to Bohol spend a few nights along the Loboc River. It’s a magical corner of the Philippines. The water runs down from the hills and reflects the exotic greens of the abaca ferns growing along the banks. The river the snakes to the sea in long, sensuous curves. Small villages and huts are tucked away on the water’s edge. There are waterfalls and cold springs, bridges and boats, and trees that glow with fireflies at dusk. No visit to Bohol is complete without trying stand-up paddleboarding (SUP) in Loboc. Don’t worry if you’ve never done SUP before: It’s heaps of fun and easy even for first-timers. Before you know it you’ll be gliding meditatively along, captain of your own board, soaking up the scenes and sounds of river life. TIP: SUP Tours are the ones to go with and they have a range of tours to choose from. I loved the half-day tour to Busay Falls and back, but even an hour of SUP is worth doing if you’re in Bohol. See tours and rates on the SUP Tours Philippines website. This is a great sustainable choice for families, couples or anyone who just wants to see a different part of the Philippines and be close to nature. Loboc River Resort has a rustic restaurant right on the river where you can enjoy tasty Filipino dishes and breakfast by the water. There’s a pool with loungers, a couple chickens on the loose, a monkey island, fishponds, a small reading and WiFi nook, bancas and kayaks for rent, and best of all – a magical firefly tour after dark. One of the things I love most about staying in Loboc is being near the local people and seeing how they live their lives. For example, early in the morning a small boat ferries children across the river so they can go to school. They go five or six at a time and they have to stand because there isn’t enough room to sit. On the river you’ll pass basketball games in action, people fishing, and families returning to their homes by boat with a new sack of rice. There’s a real calmness to Loboc that characterizes much of the Philippines. Planning a trip? Check out these 10 must-do activities for your Bohol itinerary. The cable car (250 pesos) takes a few minutes each way, and the zipline (350 pesos) is a 10-second thrill. You can also buy a combo ticket, going one way on each ride for 350 pesos. The Loboc Eco-tourism Adventure Park is open from 8:30 am to 5:30 pm. Not as easy at it looks, but lots of fun still. Most resorts on or near the river will let you rent small Filipino outrigger boats, called bancas, for a sunrise or sunset paddle. It’s a great way to get an upper body workout and explore the destination at the same time. To be completely honest, I’d like the traditional Filipino food to have a little more finesse, and the cultural attractions to be a little less demeaning (specifically the stopover at the Ati-atihan tribe.) That said, going for a buffet lunch on the river is undeniably a fun experience if you have the time and don’t mind big groups. The water is so unbelievably green (Loboc River is one of the cleanest in the country) and there’s something pleasant about cruising past waving fronds and feeling the river breeze while someone sings, ‘Country Roads’ in a Filipino accent. This is my absolute must-do in Bohol, no matter where you’re staying. The fireflies come out at 8pm, and new moon nights are the best time to go. You’ll clamber into a little banca, which is paddled silently onto the wide, inky water in the dark. The ride itself is haunting, with the dark silhouettes of trees on the banks and thousands of stars above. When you find the firefly trees, you’ll be completely enthralled. TIP: Don’t do the firefly tours in Loay — they use noisy motorboats. Instead go for the paddleboat tours from Loboc River Resort. Non-guests who are eating the restaurant can also take the tour. Just book with the resort’s front desk. That’s it! I hope you enjoy being there as much as I always do. If you haven’t picked a hotel in Bohol yet, be sure to check out my list of 7 Fantastic Places to Stay in Bohol for Nature Lovers.